MetroPCS has graced us with yet another phenomenal deal to kickstart 2018. This first is not your average phone, because LG has given the Face Recognition Unlock a shot with this mid-ranger after the iPhone X landslide. It didn’t disappoint though, as it is easy and fast to setup. As for the security it offers, it’s something you’d expect from a $60 phone (MetroPCS price save $80), as it can unlock using your own picture. (You can take a look at the video here). It’s not something you can expect from Apple, as it’s way cheaper than the iPhone X, but it does make up for the convenience it offers. LG Aristo 2 has definitely proven to us that Facial Recognition in iPhone X is not overrated. The theory that Facial Recognition technology can be on a mid-range phone is debunked, for now. Nonetheless, that feature sure added up a little novelty on the LG Aristo 2, and again for the price it asks, you can’t expect more. On the flip side, unboxing the phone isn’t really exciting as the box from MetroPCS is usually straightforward with the phone’s features printed at the back cover. 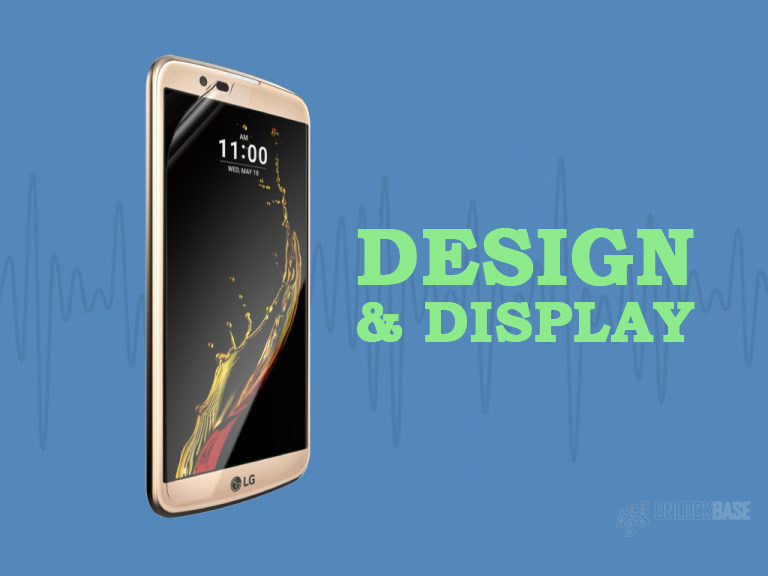 The phone is designed with full HD screen at 5-in IPS display which is long, sleek, thin, and easy in your hands. It has a mirror-looking back cover although it only has a plastic build. It also houses the camera, flash, and power button. LG Aristo 2 runs on Android Nougat and has a 16GB ROM with a 2GB RAM. Compared to the LG Aristo, this phone’s RAM and processor capacity is slightly bigger and that’s accounted as one of the major improvements. It’s also micro-SD expandable to upto 32GB and it’s powered by a 1.4GHz quadcore processor, which gives us the reason why the Facial Recognition lock system works fast. The phone’s sensors and camera are safely situated at the upper front portion of the phone. The front facing camera is 5MP and Phase Detection Auto Focus rear camera that has an LED flash. There’s not much difference between the LG Aristo and LG Aristo 2. Both have the same 5-in screen and apparently running on the same Quadcore processor. The placements of the buttons at the back are also very similar as you will still have the power button right below the camera. The only difference is the fringe on the back cover as LG Aristo has them but the LG Aristo 2 only has a plain mirror finish. The LG logo are also placed differently as the predecessor has them at the middle, while the latter has it at the bottom. The speakers are also on the same spot, except for a difference in how the holes were designed (it doesn’t differ much in sound quality). On the front, the second generation Aristo does look better as it appears cleaner, without the LG logo at the bottom and with the camera on the upper portion, making it look more professional and minimalistic. Overall, it doesn’t make that much difference on the aesthetic level of the phone; only the LG Aristo 2 looks a little more classy and blends to most 2017 phone models with glass finish. The performance on the newly-released LG is also better as it can support multiple windows, giving it an edge compared to other phones on its price range. It also has a much higher RAM, so multitasking on this phone should go seamless even when you use a lot of internet or multimedia. The latter also has a much updated Android version, which means it boasts the latest security and features you can expect from Android. Picture quality are also similar, but on par with other phones it doesn’t really make it to the instagram-lovely cut. The display on the LG Aristo 2 is also much better as it is better lighted and has much better saturated color. 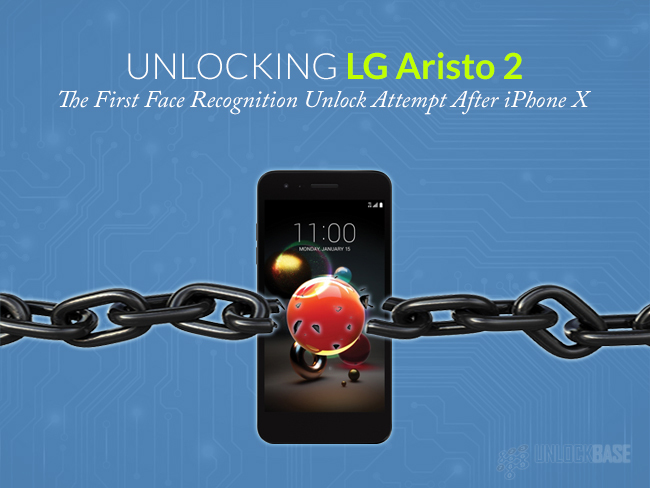 LG Aristo 2 has upgraded on both the inside and the outside. 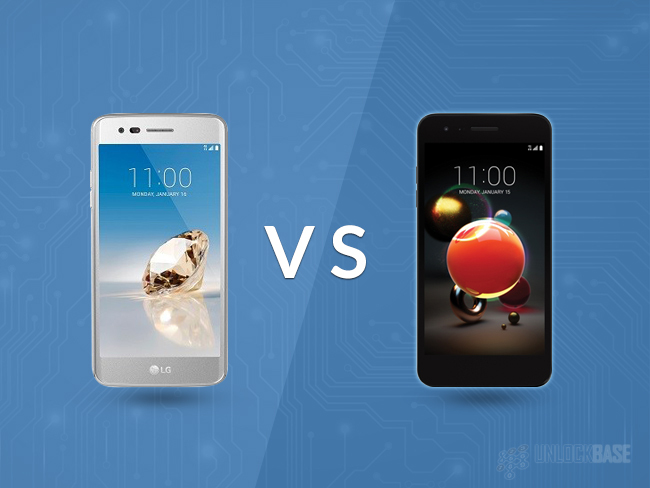 The design, display, and build of the second generation phone is obviously much better compared to its predecessor. The screen has better saturation, the back cover looks more professional and trendy and it does feel more premium in the hands. Concerning the performance, LG Aristo 2 is slightly faster compared to the LG Aristo because it has a better RAM and can support multiple windows. Setting up the Facial Recognition Unlock is also straightforward and it unlocks pretty fast without needing to position the phone on a particular angle, which is very convenient. The only caveat is that this feature is so easy to cheat, so you might want to take advantage of adding up another unlock feature when you need it. If you are considering the price, this specific model is sold at less than half the price at MetroPCS and it sure doesn’t disappoint when compared to other phones in the mid-range arena. Upgrading to the phone is a good idea only when you are an LG mid-range fan, but if you’re not, 2018 is just getting started and there’s so much more in store for you in less than a month from now. So stay tuned! LG has stocked another unit that will definitely be a best-seller. This high-end mid-range smartphone has the right specs for an affordable price, bringing the hype on the K-series. 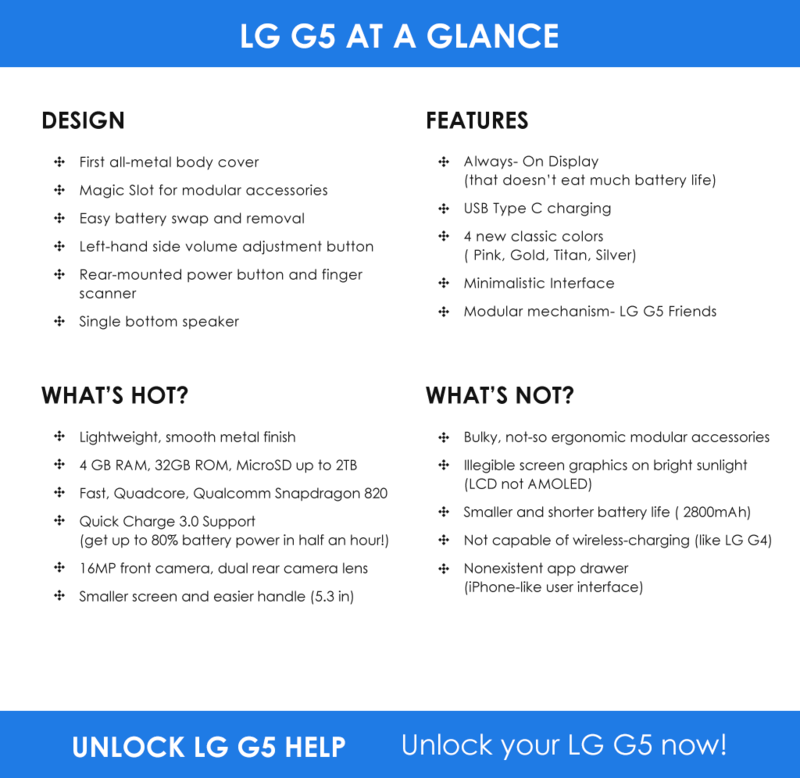 If you are interested in buying the LG K10, here’s an overview of its extensive specs in detail. 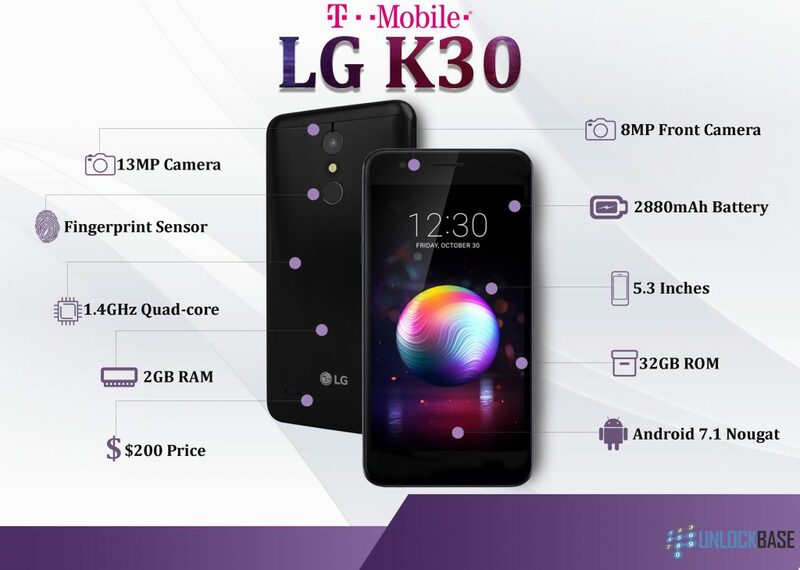 While LG may have set its standards on mid-range phones, K10 seemed to overwhelm mobile enthusiasts with its modern design. 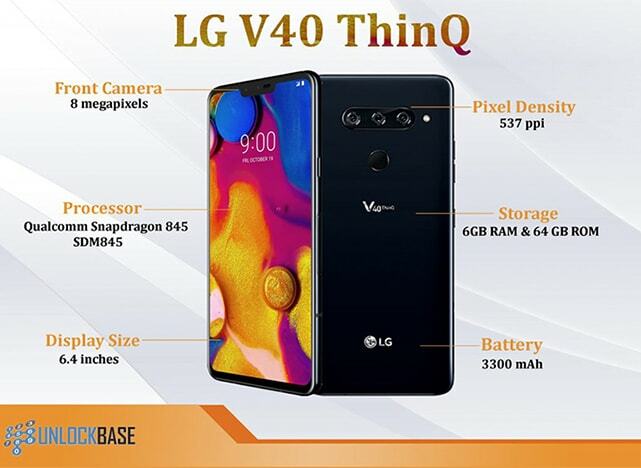 It looked sleek and smooth with its polycarbonate bodice, buttonless frame, and the rear camera at the back with the volume rocker and power button, looking similarly like one of the company’s premium mobile units – LG G4. 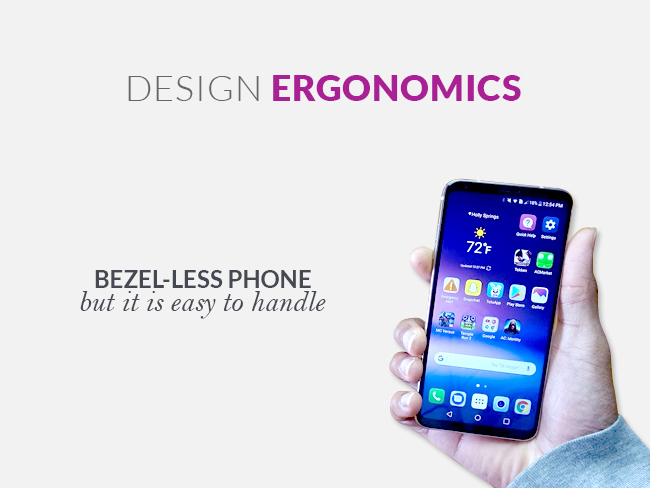 Though, it somehow differs from the latter when you flip for the phone’s rear since it shows a refreshing pebble design that may be a new design language for the company’s units, or the K-series lineup, perhaps. The K10 also shined for its grand scale 5.3-inch IPS in-cell LCD display panel stretched along with its 2.5D Arc Glass design for an edge-free feel. It’s spacious, touch capacitive, glossy, and makes a perfect go-to device for a viewing experience. Though many would doubt its 720-pixel resolution, the device can definitely speak for itself. For its price, LG K10 can undoubtedly capture great snaps and shoot quality videos with its 8MP main and 5MP front camera. 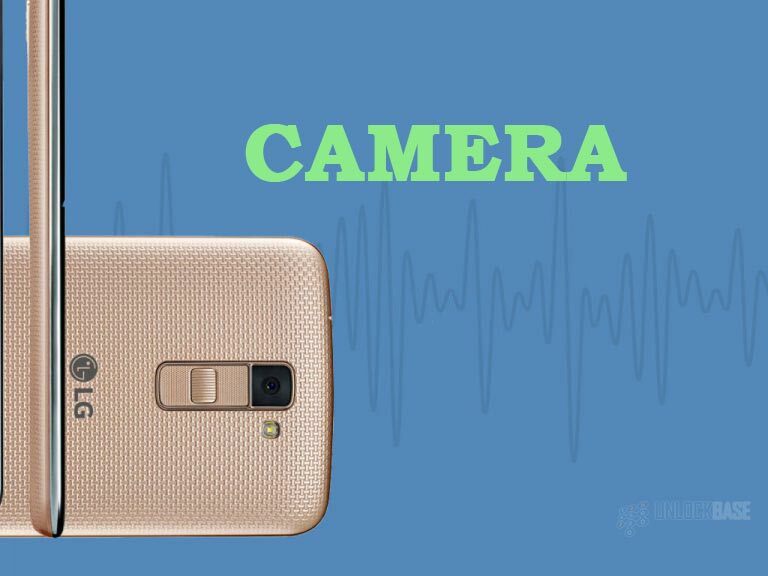 It is equipped with features like autofocus, burst shot, and gesture shots via hand and voice, offering people options on how to conveniently take snaps, especially when taking a group picture and snapping photos in action. It also has an LED flash for night snaps and is capable of live shots, video screenshots, and quick sharing on social media platforms after taking pictures and videos. 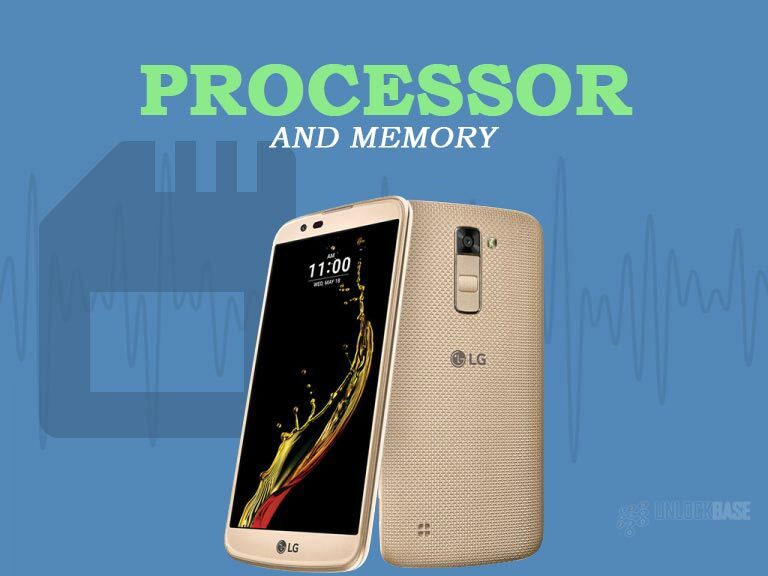 The device is powered by a Qualcomm Snapdragon 1.27GHz quad-core processor with 1.5GB of RAM. 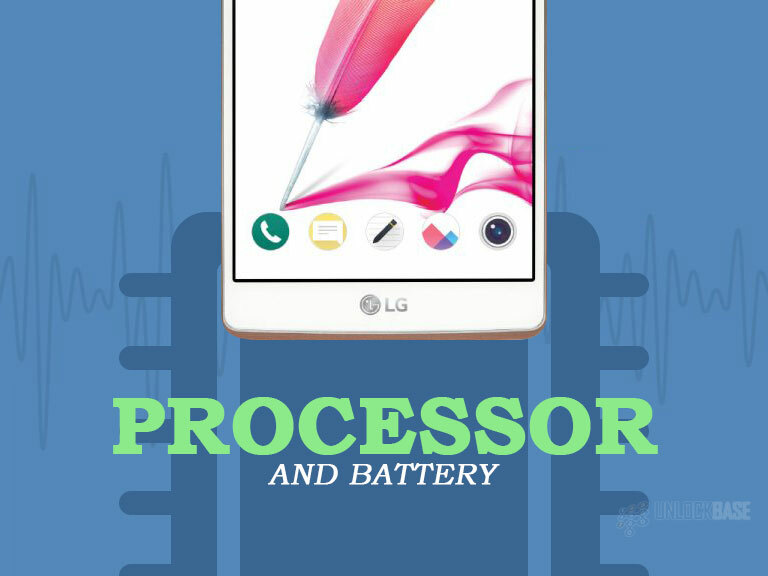 These specs enable smooth multitasking on K10 especially with processing tasks including games and messaging apps. It is also equipped with a 16GB of internal storage, perfect for storing apps and multimedia files. If you need an extra space for your files, you can also trust its Micro SD slot that’s capable of covering 32GB at maximum. 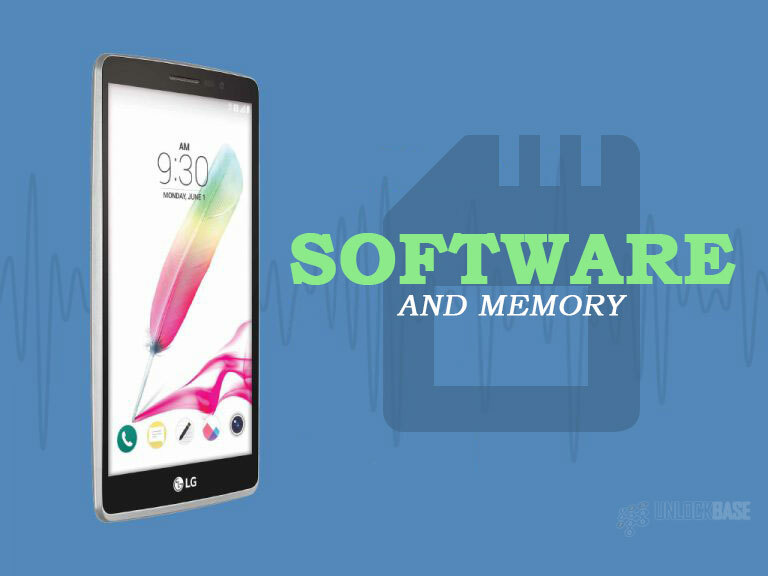 Running on Android Marshmallow 6.0, LG K10 is extremely a user-friendly smartphone especially for those who are already comfortable with the Android interface. More than that, it also qualifies as a great choice for all-day usage considering its battery capacity of 2220 mAh; which is also removable, by the way. 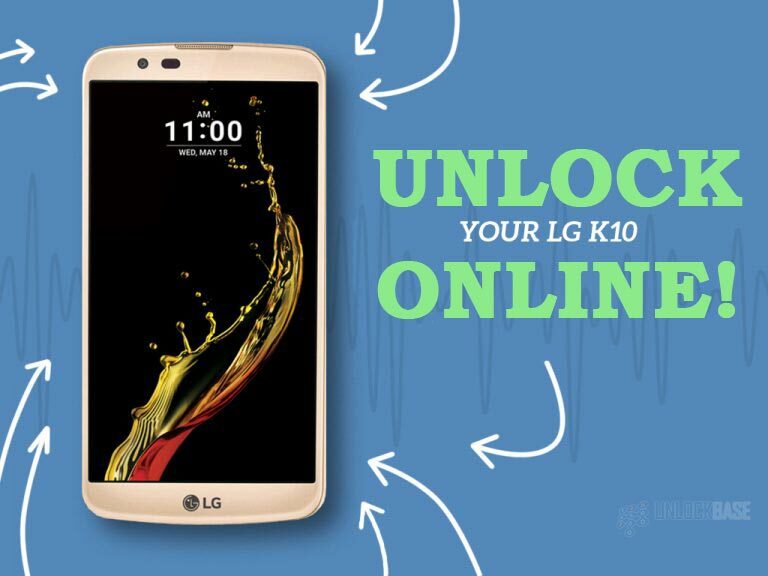 LG K10 is equipped with an efficient 4G/LTE network technology deployment. This network deployment also makes the unit a good company for calling, and even cellular data connection. Aside from this, the device is also equipped with great connectivity protocols such as 802.11 Wi-Fi, NFC, Bluetooth 4.1, and S-GPS, offering users an efficient unit to spend their money on. 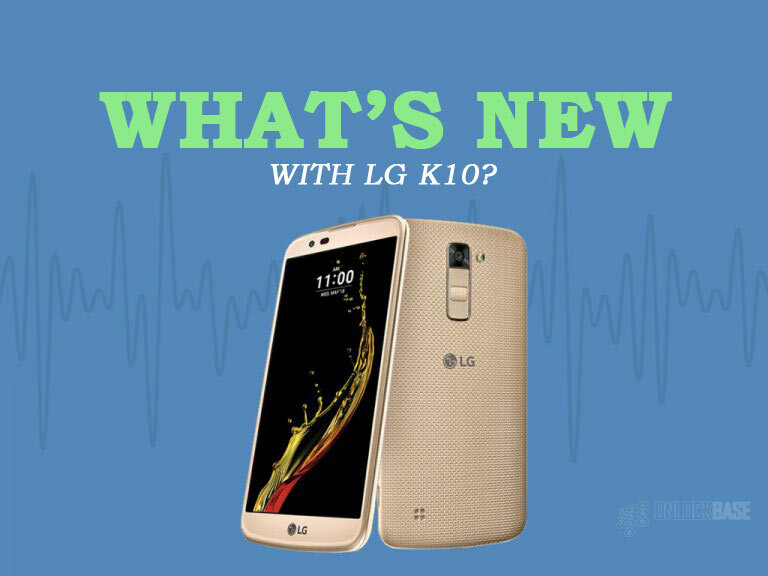 Since its launch in 2016, LG K10 has been the talk of the town, especially among the K-series. Even labeling the unit as the highest-end of all mid-range units of the LG smartphone lineup. 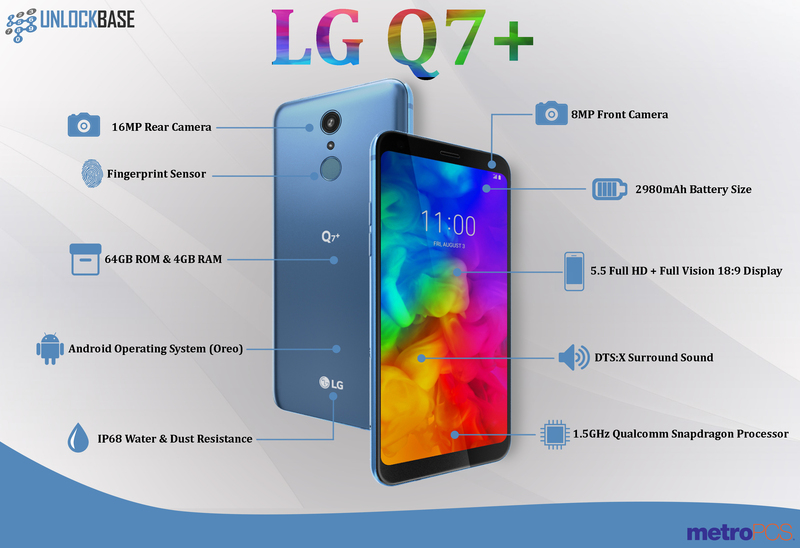 Generally, its key features include its overwhelming, full 5.3-inch HD IPS in-cell display with a 2.5D Arc glass panel hovering over the space for an edge-free feel. Undoubtedly, this factor has made the unit a favorite with regard to vivid, viewing experience. 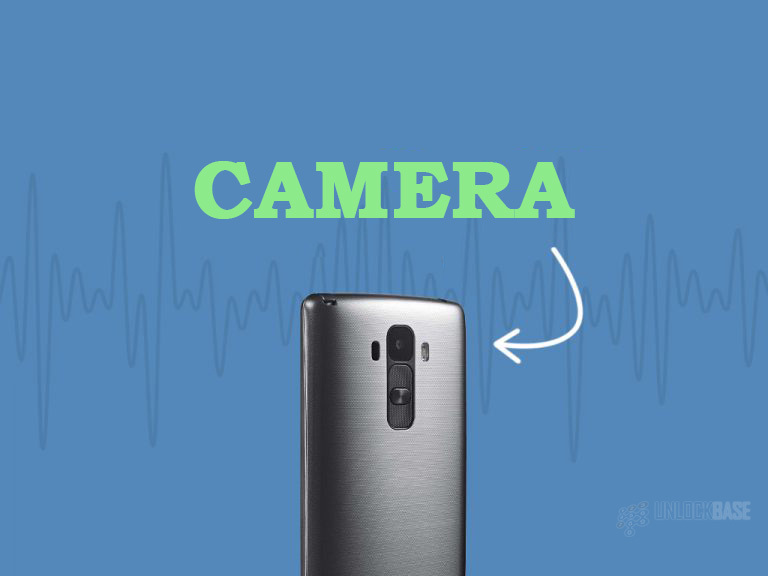 It also flaunts its 8MP rear camera that’s equipped with autofocus and gesture shots features such as hand and voice gesture – taking snapping photos into a higher level. Lastly, it is also a smart buy considering its price for its well-designed specs and storage allocation. 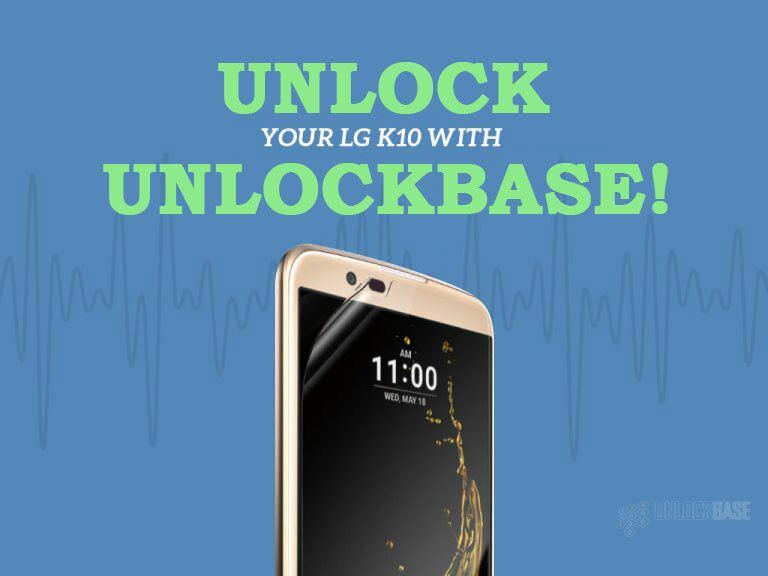 If you are looking for ways to fully use your LG K10’s fearless features, specifically its 4G/LTE network deployment, you can opt for UnlockBase’s unlocking service. UnlockBase has earned its reputation over the web by providing professional, efficient, fast, and safe unlocking service. How? Basically, the service is using a Device Unlock App to provide a convenient, fast, and easy request-and-apply processing of the device. 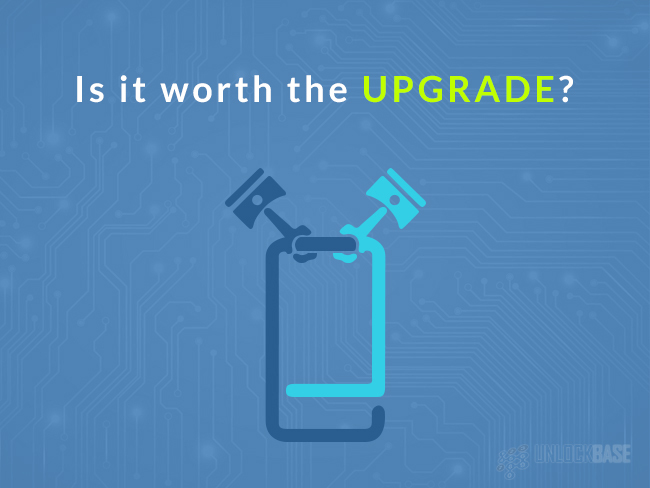 More so, you can always trust that UnlockBase can cater to your unlocking issues as it has a huge collection of compatible devices from brands to models. You’ll never go wrong with UnlockBase with proven and tested expertise in the niche. Need our help? Contact us here. 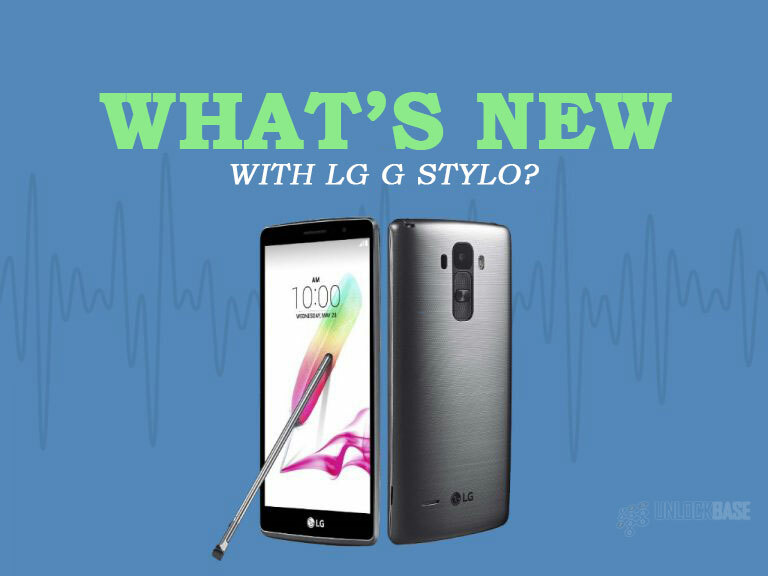 Having been released in May 2015, the LG G Stylo (also dubbed as the LG G4 Stylus) has a 5.7-inch full screen equipped with IPS display screen and is capable of 1,280 by 720-pixel resolution. Lauded by tech savvies, the phone’s brightness capacity is great for both indoor and outdoor use especially when viewing videos and photos. Furthermore, the IPS LCD touchscreen’s responsiveness is remarkable – no need to double tap to access a particular app or feature. With regards to its design, the smartphone’s comparatively large for a one-hand use, even measuring up to 6.1 by 3.1 by 0.38 inches overall and weighs for about 5.85 ounces. Though the intentional arched back eventually helps the user for a good grip. Moreover, it also has the right placement of controls and details. These include the 3.55mm headphone jack and the stylus at the top of the device, the micro-USB charging port at the bottom, the power button at the back along with the volume rocker and the main camera lens, the laser-guided focus and flash just above the control buttons, and a small portion for the audio speaker below. There’s also an allocated slot for prying off the rear panel for accessing the battery and the Micro SD slot. It’s hard not to notice but the removable rear cover and the control buttons are all made of lightweight matte plastic material encompassed with running dashed lines – making the phone look grander despite the material used. 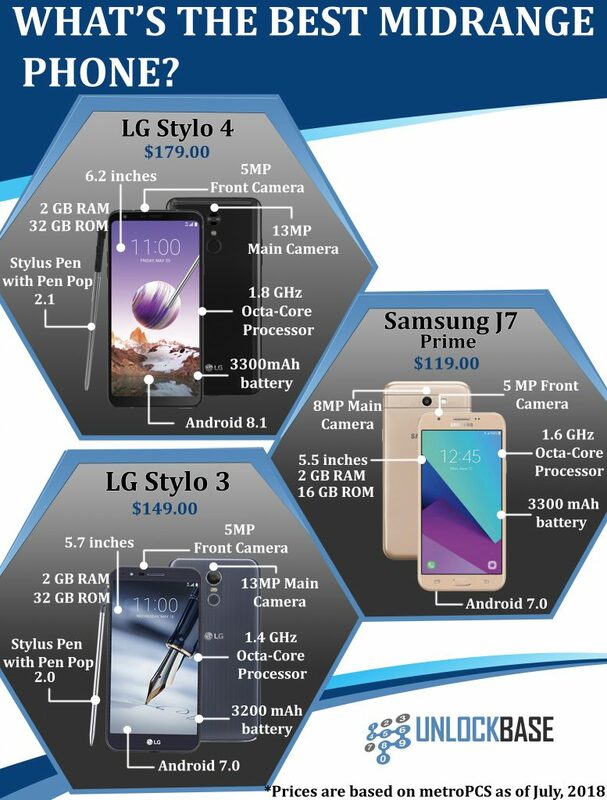 Moving on with the camera’s specs, the LG G Stylo is also equipped with the brand’s high-end laser-guided focus aside from the 8MP rear and the 5MP front camera. This allows the lens to capture great photos in a decent shutter speed. Its video quality is also a sight to see, as the device picks up audio and moving objects effectively. It does not also lag in between shooting, hence, it can be a great buy for those who love shooting videos and capturing great photos outdoors. With regards to the call quality, the connection is truly consistent in allowing the users to communicate effectively. 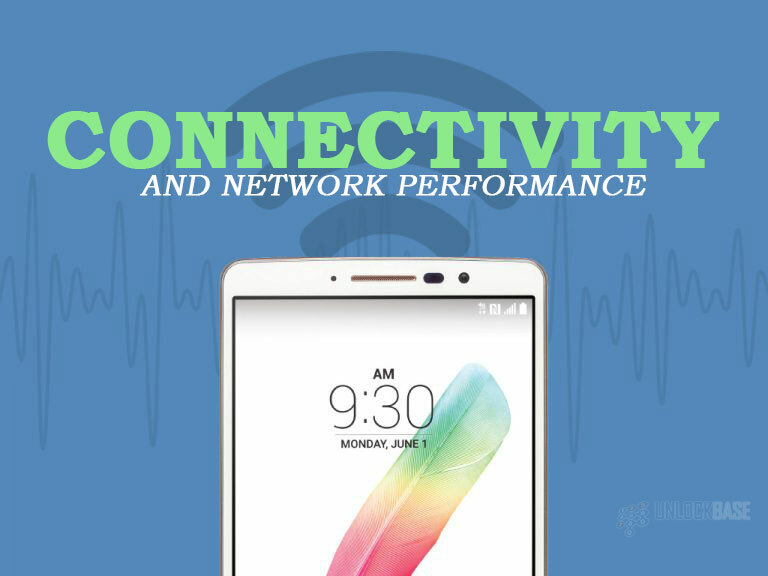 In addition, it is also capable of 4G LTE data speed for great internet surfing experience. Other connectivity protocols include Wi-Fi 802.11, Bluetooth 4.1, A-GPS, and the NFC. These connectivity protocols allow the device to share and connect with other devices in a quick and easy manner. 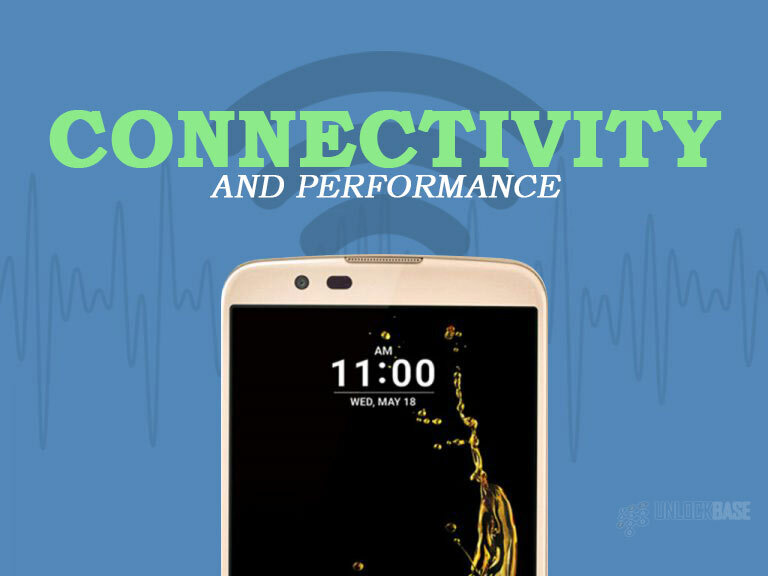 Powered by a Qualcomm Snapdragon Quad-Core processor clocked at 1.2GHz coupled with a 2GB of RAM, it is safe to say that the unit is powerful enough to process tasks smoothly – avoiding lags and app crashes to disrupt your routine. Going further, it also has a 3,000mAh battery capacity that allows the device running for 24 hours. 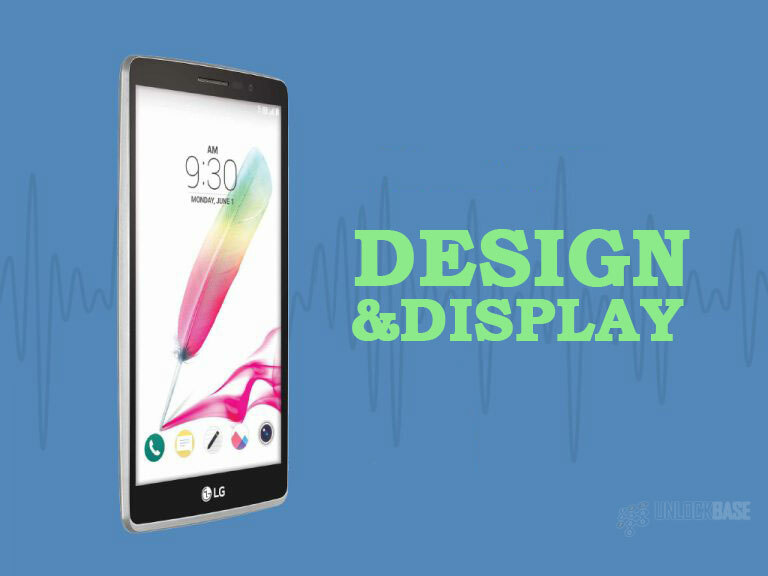 The LG G Stylo runs on a 5.1 Lollipop Android version, which makes it acquire the impressive features of the said operating system’s version. It is also equipped with a 16GB of internal storage, a good amount of memory space for storing high-quality photos, videos, music, and apps. This can also be expanded with the Micro SD slot which supports up to 32GB of additional storage. The LG G Stylo is definitely a budget-wise stylus phablet. As aside from the full and wide 5.7-inch IPS LCD display, it’s also equipped with the laser-guided auto-focus feature that the brand’s high-end smartphone units have. It also allowed a great amount of storage for multimedia storage plus, the 2GB of RAM for a smooth multitasking. However, the highlight of this unit’s specs is its stylus pen. Basically, the pen measures about 4 inches and has a cute-looking soft, rubber tip. It is thin enough to hold and allows a good grip for comfortable writing. It can be used to mark, type, doodle, draw, write, cut, copy and paste – whatever you wish to do. It is also efficient for swiping, dragging, and trapping onto the screen. 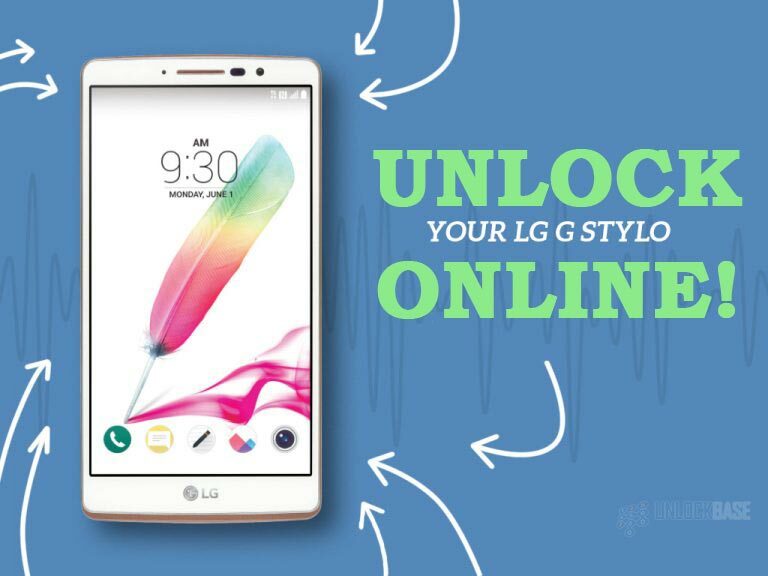 Of course, the stylus pen also comes with the exclusive LG feature – QuickMemo. This allows users to jot down and annotate notes directly on the screen. 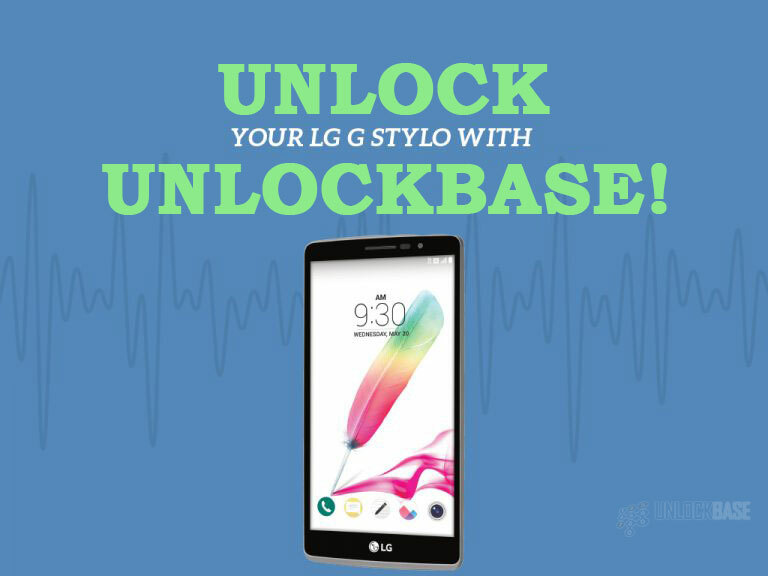 If you would want to further enjoy the best out of your LG G Stylo, you can contact UnlockBase for its unlocking service. We will help you make switching SIM networks possible for a faster and more stable internet connection. 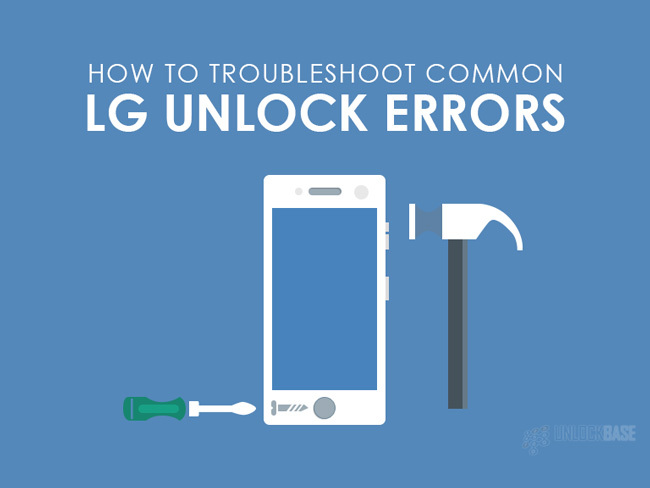 Moreover, there’s no need to worry about manual codes as the service uses the Device Unlock APP for a convenient request-and-apply processing of your phone. It also has a huge database of varying phone brands and models that it can provide service to. If you need further details about the service, please feel free to contact UnlockBase. We’ll be more than glad to attend to your inquiries. 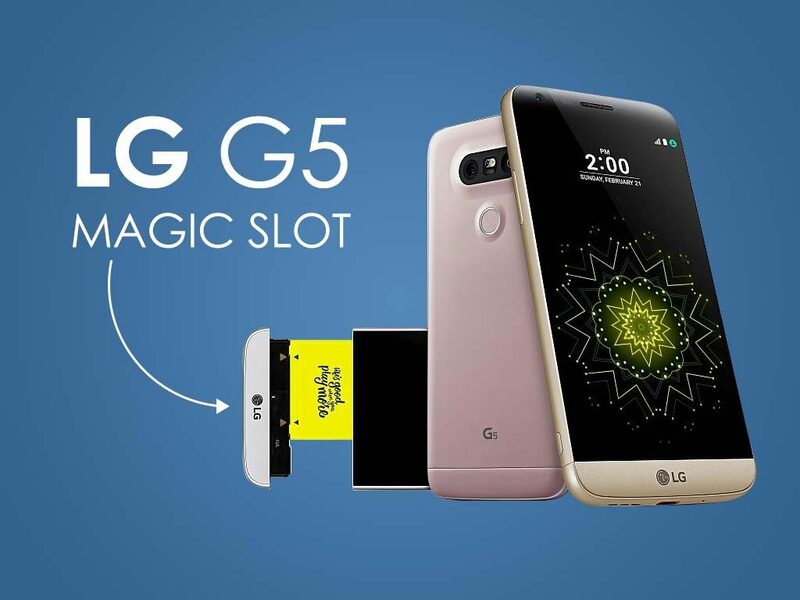 The Magic Slot is a design innovation by LG in its first attempt to make modular phones. If there’s anything more interesting with LG G5, it’s the Magic Slot. The magic slot contains the battery, sim card and the microSD card slots giving easier access to the user’s most important convertible accessories. The Magic Slot is the removable bottom of the phone that allows the users to replace the battery with one easy click of the button at the lower right-hand side of the phone. It’s also the same slot used for switching between G5’s modular accessories. Despite the fact that most manufacturers are now moving towards non-removable back covers and batteries, LG G5 matched it with a full blast metallic casing but of removable battery. Quite the genius. If you are an avid LG user, the LG G5 is probably going to feel strange for you. Gone are the volume keys at the back that your finger worked so hard to get used to, because the volume buttons are now on the left-hand side, conforming to the physical design of other smartphones. Aside from that, LG also has a new fingerprint scanner to power it on. Unlike its predecessors in the G series, this power button is flat mounted on the rear side, so it may take a little getting used to. Overall, according to customer reviews, the power button isn’t really as distracting as they thought. LG did a good job at making the home screen really clean and minimalistic, however, they’d gone extremely far to eliminate the app drawer that really confuses LG and even long-time Android users. With the app drawer gone, the phone’s interface looks more like that of an iPhone more than an Android. People think that LG is probably risking its features to make it appeal to iPhone users who are tempted to switch to or try Android for economical reasons. It’s good that LG G5 now has a USB Type C port for charging that conforms to the standard of other Android and smart devices worldwide. This is good news compared to other LG flagship devices which only works with LG provisioned chargers. As per customer reviews, there’s not much improvement on LG G5’s battery life and SOT, however, compared to its predecessors, this model stands better chances of competing with other brands’ flagship devices like Samsung S7 who has more than 9 hours of battery life. Also, the easy battery switch makes it easier for users to seamlessly use their phones when traveling, gaming or surfing minus the usual hassle of charging while being on their phones. An extra battery is added upon purchase. Since LG G5 has Quick charge 3.0 Support, users can now have at least 80% battery in just 30 minutes of charging which is equally competitive to other new smartphone models. The metal casing is the first of all the LG family’s G Series to ultimately resolve overheating issues from the preceding model. LG G5’s metallic cover isn’t technically metal on your fingertips. It has gone through multistage processes that keep your hands from stinking rust. In addition, the metal casing ironically has a smoother finish compared to LG G4 which is somehow rough to the hands. Despite being all-metal, LG G5 is lightweight and is ergonomically made for mobile user experience. 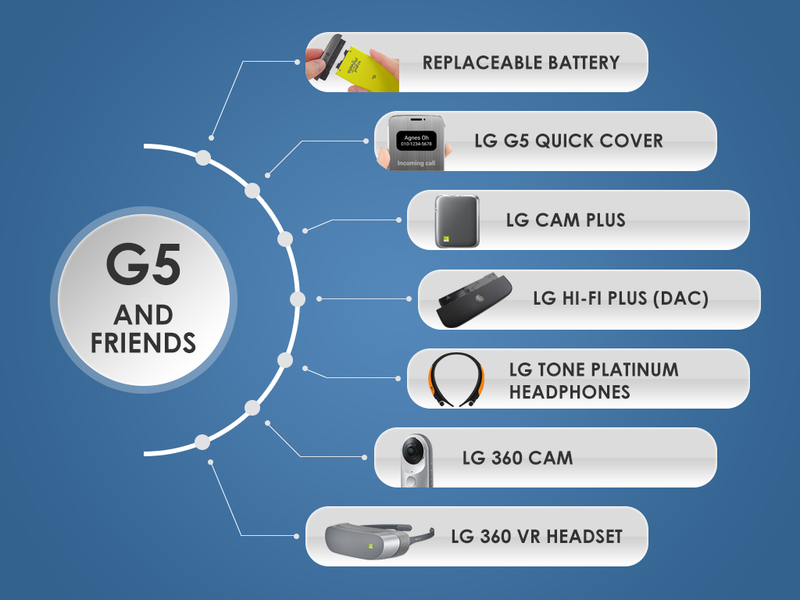 The LG G5 features a modular mechanism that allows other accessories (LG calls them *Friends), to improve the phone’s features like its camera, audio, and battery. Although LG G5 isn’t the only modular phone available in the market, it offers a wide array of modular accessories that’s exciting to use for LG fans. The LG G5 has 14 different Friends but not all of them are available to the US, EU, and other countries. If you are interested with an LG G5 Friend (accessory), be sure to check its availability in your country first. 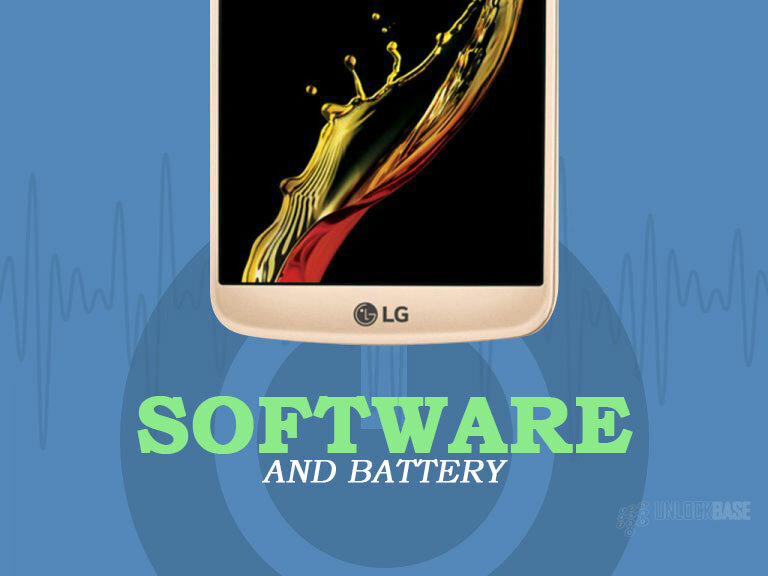 The replaceable battery is considered one critical advantage of the LG G5 compared to other flagship devices from brands like Samsung, iPhone, Xiaomi, etc. LG G5 comes with a spare battery upon purchase. The Quick Cover flip case is the answer to G5’s scratch-prone screen and it allows users to pass users’ touches to the screen even when it is closed. However, this G5 Friend doesn’t look so friendly to most customers, because it isn’t magnetic and won’t stay closed which unfortunately defeats the purpose. .
LG G5’s camera is already awesome but LG can’t help but add another Friend to make it even better. LG Cam Plus is created to help users with the camera controls like video, shutter, and zoom controls, but that’s not the best part about it. This Friend can add more battery life by replenishing the power consumption of your cam app. 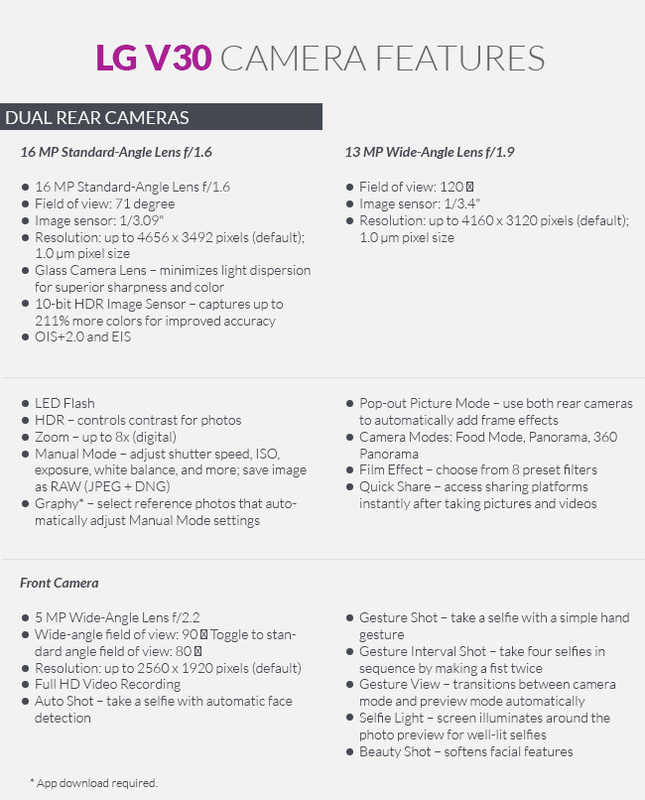 Although the LG Cam Plus is made for the said purposes, it is a total epic fail for most customers. Starting at $70, the LG Cam Plus, somehow causes the camera to “stop responding” or lag when zooming and it spins freely either way so it doesn’t give any reassurance that you have reached the max zoom in or out capability. Again, beware of buying LG Cam Plus online because it’s not universally compatible with all LG G5 phones and it might depend also on your carrier. If you are the audiophile-type then this is a thing you wouldn’t want to miss. This Friend offers crisp and clear music that every audiophile would want to hear. It also comes along with a USB Type C cable that you can easily connect to a computer and it works just as fabulous. However, this isn’t available in the US and isn’t compatible with the US LG G5 models either, so don’t bother getting one from Europe or wherever online. This new addition to the LG Tone line is a G5 Friend, and this Bluetooth headphone is great for everyone, except of course to audiophiles. The design is ergonomic and comfortable to wear on the neck. It’s quite fashionable and it’s undoubtedly a level up compared to its predecessors. So, aside from the LG Cam Plus, LG G5 got its camera game up a notch with yet another Friend, the LG 360 Cam. It doesn’t have an internal memory but you can stick in an SDXC card of up to 1TB. This can only be controlled using a smartphone through Bluetooth connection, however, the process of connecting to the cell phone app can be confusing at times. On a lighter note, this model is not as expensive as with other 360 cameras available in the market but it almost has the same video and picture quality. 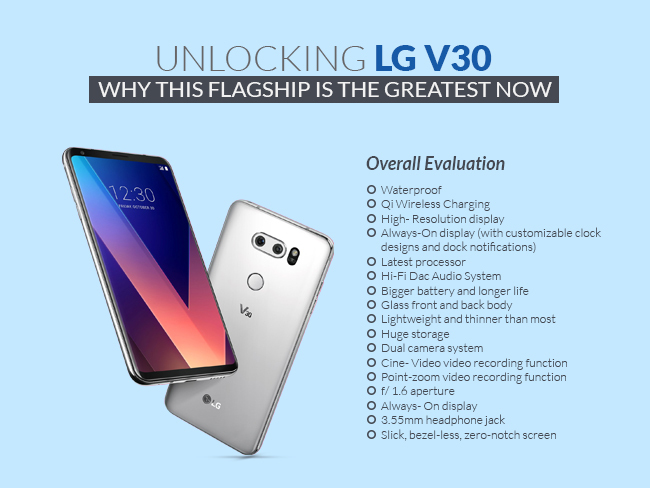 As the name suggests, the 360 VR is a Virtual Reality headset and it works only with LG G5, a not so clever marketing strategy. Nonetheless, it’s lightweight compared to that of Samsung’s. You can connect it to LG G5 phone via USB type C cable and it only works after downloading all the necessary apps like Friends Manager, 360 VR Manager, and vrChannel. This VR attempt didn’t get LG the praises it was looking for but it’s way more expensive than other VRs. Unfortunately, the experience doesn’t justify the price of the LG 360 VR headset. 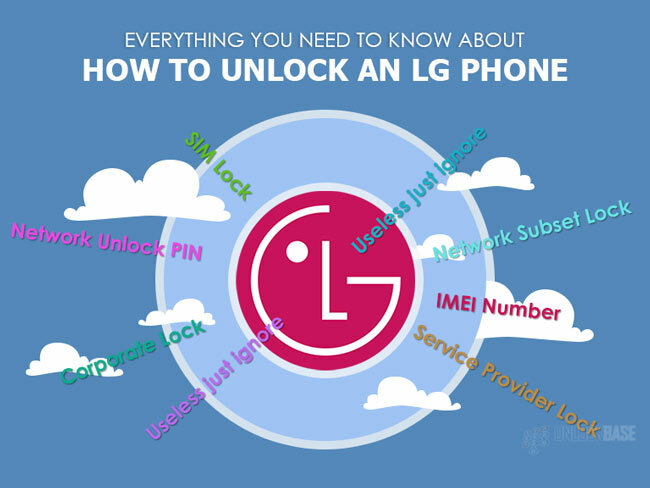 Want to Unlock your LG G5? No need to go elsewhere, we’re the go-to-guy for all unlocking services! And guess what? 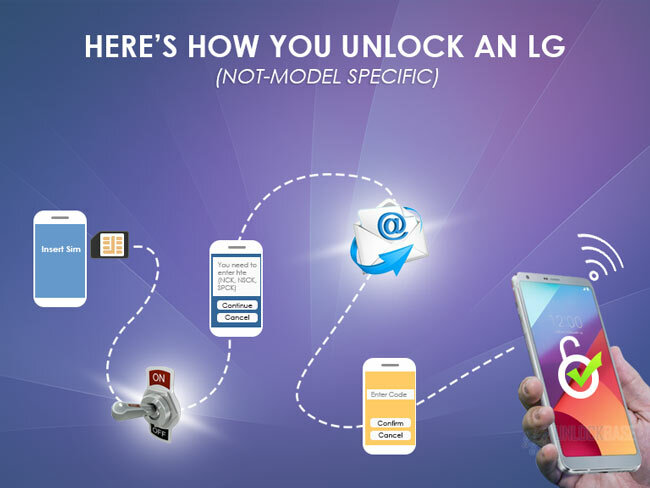 We now unlock LG G5! We have 24/7 support to help make the process as seamless as possible. First, check if your phone is already unlocked. Try another sim card apart from your carrier or service provider. Changing sim cards WILL NOT void your warranty. If it is already unlocked, your phone will detect the sim card and you will have signal bars on the upper right-hand corner. If it is otherwise locked with your current service provider, as soon as it powers on, you will be prompted with a message saying “Sim network unlock PIN Unlock Attempt 1 of 10” and it will ask you to input the Unlock code. Go to “Setting”, click “Status”. Take note of your IMEI number. Our team is available 24/7 to help you proceed with the unlocking process. Whether you are travelling or just switching to another service provider, we provide all of your unlocking needs. Want to know more? Talk to us!